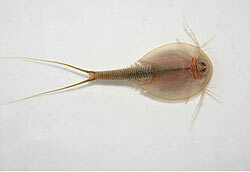 The Branchiopods are a sub-group (class) of Crustaceans and contain the fairy shrimp (sea monkeys), clam shrimp, water fleas and tadpole shrimp. Most of these are small, fresh or brackish water animals that feed on plankton and detritus, with the exception of the water fleas (Cladocera), many of which are marine. There are almost 800 known species and the major groups have many differences between them. 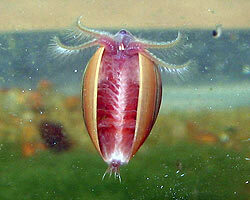 They are only found in freshwater. 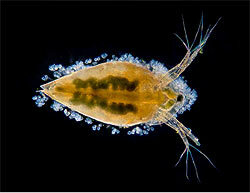 They are either herbivores, filtering plankton, or carnivores. Their eggs will survive drought and large temperature extremes for several years and hatch about 30 hours after rains fill the pools where they live. Most hatch from unfertilized eggs which can withstand freezing and drought, and can hatch after 12 months as long as 25 years after they are released from the female. 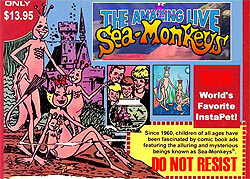 Sea-Monkeys is the brand name for Artemia sold in hatching kits, as a novelty aquarium pet aimed at children, in the United States and the United Kingdom since 1960. They are often sold in a blue or red, plastic aquarium. Inside, there are water purifier, eggs and food. It is sold under the title "The Amazing Live Sea-Monkeys Ocean-Zoo". 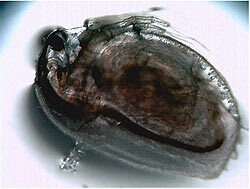 They are a variant of brine shrimp or Artemia salina. The ability of unhatched "Sea-Monkeys" that allows them to be packaged and shipped is that they enter cryptobiosis, a suspended animation that occurs naturally in Sea-Monkeys in order to help them survive until ideal conditions appear. 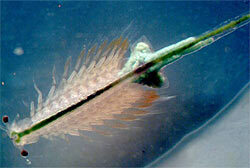 Sea-Monkeys can stay in this state for up to 2 years. When released into water that meets the conditions needed for the Sea-Monkeys to survive, they leave this state and emerge from their cysts.